Home » all » Is Google+ (Google Plus) important for businesses and brands? Almost 18 months after launch, Google+ (Google Plus) seems unable to crack the social media market which is still ruled by Facebook and Twitter, but does that mean Google+ can be ignored by businesses and brands? It seems to me that we should stop thinking about Google+ as a social media channel competing with Facebook and Twitter – they’re both too well entrenched and too user-friendly for Google+ to overhaul. Whatever Google says about user numbers for Google+ (currently at 400 million worldwide), simply ask yourself how many people do you know use Google+ for pleasure compared to Facebook and Twitter – chances are it’s not many. Google is aggressively incorporating Google+ into its search results, so having an effective presence on Google+ is likely to benefit your business profile in search. Facebook and Twitter are both better for chatting to customers, but they restrict Google from accessing much of their data so this limits their SEO benefits. Here are four ways Google links (or is trying to link) Google+ to search? Google creates an impactful brand ident to the right of search results with information taken from your Google+ page. 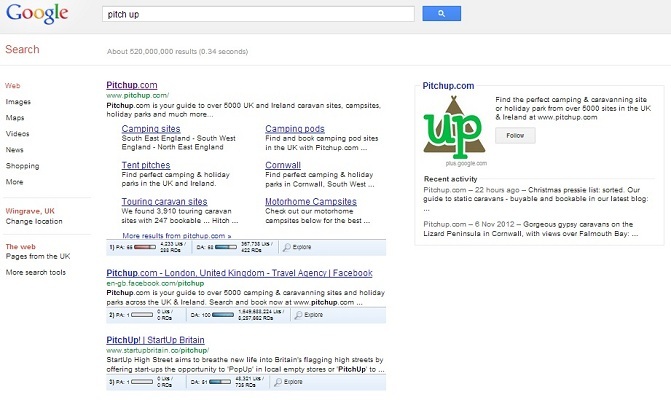 In the example below for camping specialist Pitch Up, the company’s logo, company description and recent posts appear in a box to the right of the natural search listing, giving Pitch Up double the exposure on searches and highlights the company’s latest news. The ident also has a ‘follow’ button for new fans to join the brand on Google+. Google believes that we find information more useful when it comes from people we know and trust rather than from strangers, so on Google.com the search engine is trialling ‘personal’ search results. This means that a search returns two lists, of ‘global’ and ‘personal’ results, the latter of which is made up of people connected to you via Google+. This doesn’t limit content to that which has appeared on Google+, it includes relevant content on blogs and news sites written by people who the searcher is connected to via Google+. 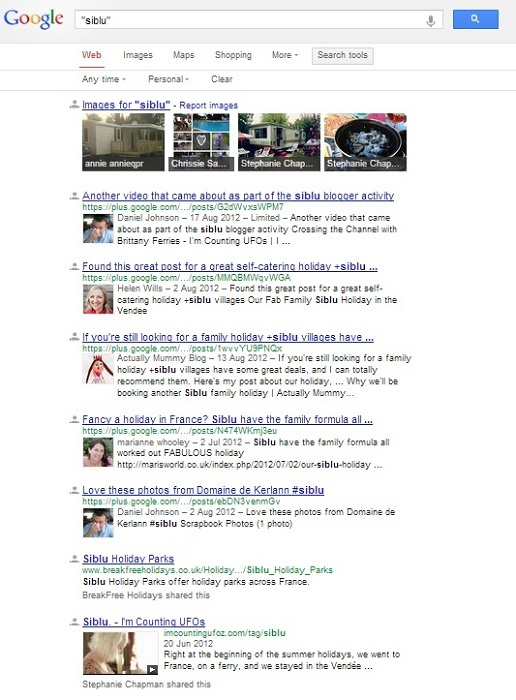 In the example below, for a search on holiday company “siblu”, the personal results include images and content from myself and from bloggers who I know and follow in Google+ – powerful stuff. Google+ integrates with all of Google’s other services, such as Google Places (now known as Google Local+) and Google Maps. In the case of Local+ listings, Google gathers basic information about a business from a variety of different places to build up a cluster of details such as Business Name, Website Address, Postal Address, Map Location, Phone and Images. This information is bundled together on a Local+ page in… Google+. it allows searchers to post reviews of the property on Google+. 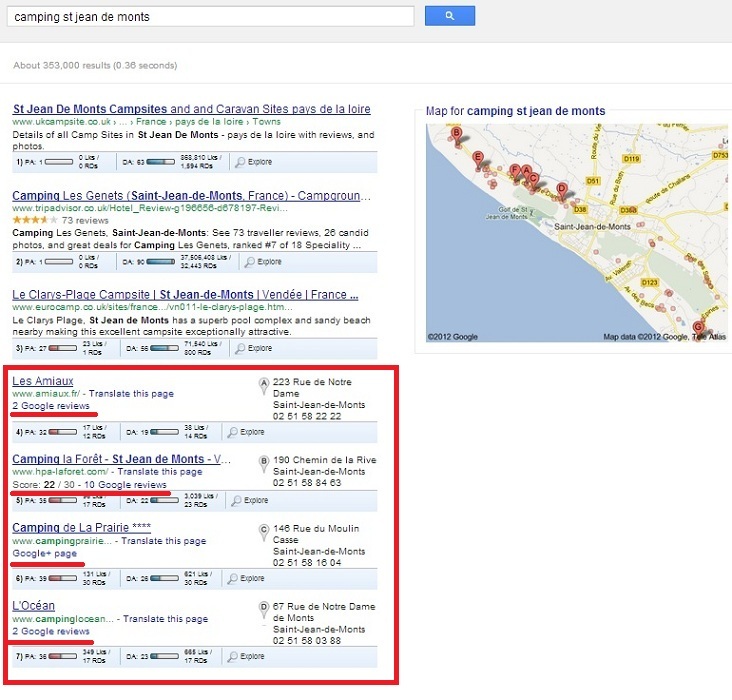 In the example below, Camping La Foret already has 10 reviews which Google translates into a score out of 30 (in this case 22/30) and showcases alongside the basic information. Businesses can grab control of this listing information by following the Edit Listing tab on the Google+ page (you won’t be able to edit information until you have proved your link to the business). So maintaining an active Google+ page will likely ensure your latest information is appearing across numerous other Google channels. It looks as though Google indexes new content from Google+ very quickly, which is vital if you want it to be found by search engines. So when you launch a new offer, product or add new information to your website, it makes sense to share it on Google+ with numerous deep links back to your website (Google+ automatically formats urls in posts as links). Google is always testing how it links Google+ into search results and many of the functions that were included when it launched have now disappeared, so the advantages listed above could change. However, it is clear that Google is committed to linking Google+ to search, and so the benefit of an effective presence is clear. How has Google+ benefited your SEO or customer engagement?